As new and innovative technology continues to evolve on a daily basis, the need for electronic components has reached unprecedented levels, with passive manufacturers in particular among those struggling to cope with demand. Electronic component shortages are now such an issue many Original Equipment Manufacturers (OEMs) are predicting their forecasted growth for 2018-2019 will be thwarted if they are unable to source the parts they need. Who (and what) is being affected? Currently, the most impacted technologies are surface mount device (SMD) Multilayer Ceramic Capacitors (MLCCs) and SMD resistors, with semiconductor lines also being affected. And it seems no one is immune, with some of the world’s most powerful device manufacturers feeling the strain – among them, multinational electronics corporation Panasonic; the semiconductor and passive electronic component manufacturer Vishay; electronic component manufacturer Murata; magnetic technology leader TDK; the consumer electronics company Kemet Corporation; and the UK-based global electronics manufacturer TT Electronics. So just how serious is the electronic component crisis? And how concerned should the manufacturers of electronic products be? In this blog post we draw on insights from global technology leader Premier Farnell, as we explore some of the key issues affecting the electronics manufacturing industry. What’s driving the increase in demand? Much of the electronic component shortage stems from the upward growth of key market segments including the automotive, industrial and consumer sectors. At the forefront is the ever-expanding development of automotive technology, which is bringing with it the requirement for specialist automotive approved components. There’s the increasing automation of cars via automated driving systems (ADS) – from the addition of automated gadgets such as parking sensors and auto windscreen wipers to the development of self-driving vehicles. And in the UK, the electric vehicle market has seen a remarkable surge in demand over the past five years. There’s also been a sizeable increase in the numbers of UK manufacturers offering EVs as part of their range and new registrations of plug-in cars have increased from 3,500 in 2013 to more than 150,000 in May 2018. The surge in popularity of electric cars and hybrid vehicles, has led to a four-fold increase in the demand for electronic components. The reason? 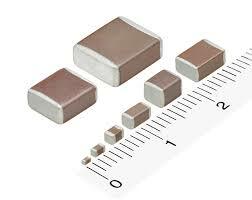 The fact that a specific type of ceramic capacitor technology is required to control the vehicle’s electronics. The higher temperatures inside the control circuits of electric vehicles mean that traditional plastic film capacitors are no longer suitable for all applications, so ceramic MLCCs are increasingly being used. The issue is though, that while a typical petrol or diesel car requires something in the region of 2,500 MLCCs, its electronic equivalent needs in excess of 10,000 MLCCs. The increased requirement for components in everyday consumer products is also putting added pressure on every stage of the manufacturing process. Within the home, there’s been an explosion in the demand for smart devices – from Smart TVs, Bluetooth speaker systems, Amazon Alexa and Googlehome to renewable energy products, solar panels and Cloud Computing – and all of which have had a direct impact on the electronics component market. There’s also the growing desire for greater connectivity “on the move” – from integrated satellite navigation devices, to digital radio, wearable sports tech and smart phone technology. The usage of electronic components in iPhones, for example, is reported to have doubled since the release of the 6S in September 2015 with the latest model reportedly using 1000 MLCCs. What’s the impact on OEMs? For OEMs who have made the strategic decision to hand over the responsibility for their electronics manufacturing to an Electronics Manufacturing Services (EMS) partner, there are several ways in which they can mitigate supply chain disruption which we cover in this separate blog post.